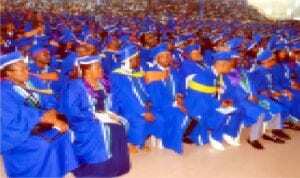 Cross section of graduating students at the convocation ceremony of Rivers State University of Science and Technology in Port Harcourt. Mandela, once described education as “the most powerful weapon which you can use to change the world”. As simple and unindulging as this description may seem, it is most apt for the wise mind. Indeed, embedded in it is the fact that education is the foundation upon which modern development is built. As the late British author, Gilbert Keith Chesterton, puts it, “without education, we are in a horrible and deadly danger of taking educated people seriously”. These quotes seem to be the guide for the present Rivers State Government under the stewardship of Chief Nyesom Ezenwo Wike, who made the importance of Education crystal clear, from the inception of his administration. On assumption of office as a Governor on May 29, 2015, Governor Wike left little doubt in the minds of keen observers regarding his interest in the education sector of the state. 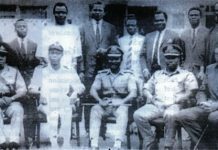 Among declarations he made at the Liberation Stadium (now Yakubu Gowon Stadium), shortly after being sworn in, was the instant recalling of about 56 lecturers of the Rivers State University of Science and technology (RSUST), who had been on strike for over three years, without salaries or other benefits. He not only declared their recall, but also gave to them all their dues that had denied them in those three years they had been on strike. Wike also declared the completion and commissioning of the abandoned faculty of Law Complex of the University within his first 100 days in office, a feat he executed to the letter. To a large extent, these and other declarations in the educational sector stated in clear terms the importance the present government attaches to education as prescribed by Mandela. The recall of the striking lecturers in RSUST and subsequent appointment of an Acting Vice Chancellor in the person of Professor Blessing Chimeizie Didia, saw the rejuvenation of the University in several areas in which activities had been dormant. For instance, staff of the Institution who had had their promotions either delayed or denied from as far back as 2007 were given their dues with the support of the government. Unionism, one of the instruments that serve as check and balance in tertiary school environment, which had been in shackles for years through the stoppage of the check off dues system, also came alive with the restoration of their dues and other rights. These and other developments have made the University gradually but steadily develop towards an entrepreneurial institution. Unlike traditional Nigeria Governments regarding continuity of governance, Governor Wike in his first one year kept to his promise of completing all projects started by his predecessor that are found to be beneficial to the people in all sectors. This promise has also played out in the educational sector. Towards this end, he took over the payment of fees and other benefits of students on Oversea Scholarships, owed by previous government. Barely three months in office, Wike released the sum of N712 million as part payment for the debt owed universities abroad. A month later, another N49 million was released for the same purpose. As at September 2015 the government has released the sum of N1.4 billion on oversea scholarships alone. However, the Governor declared that the state will be unable to fund all the oversea scholarships due to the dwindling fortunes of the state. 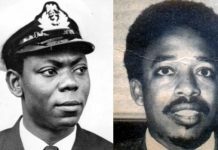 But, still unlike what several governments in the country would have opted for, rather than stop the payment of scholarship benefits of all the students abroad, he sought a way out. For those not in final year, and whose courses are available in the State, he decided to make provisions for them in RSUST and the University of Port Harcourt (UNIPORT) for them to complete their studies. A total of 328 students fell in this category and are expected back in the country in July 2016. The Governor’s commitment to develop the education sector, especially as it concerns Ignatius Ajuru University of Education (IAUE) became apparent even before he became the Governor. It started in his tenure as Supervising Minister of Education. Through his instrumentality then, several TET Fund projects were brought to the University through the NEEDS Assessment Scheme of the Federal Government, according to the Acting Vice Chancellor. Again, in May 2015, when Wike took oath of office as Governor, one of his key declarations was that the Iwofe Road, the only way in and out of IAUE, which had been a nightmare for years, will be constructed. The impassable nature of the road had deprived the University of several benefits over the years. Most notable is the visit from TET fund, which had to be put off because representatives of the Federal Agency could not pass through the road to inspect its projects in the school after doing same in neighbouring schools. They were so happy that they were coming here to inspect TET Fund Projects, but by the time they heard about the road, they just changed their decision, based on what they were told concerning the nature of the road. 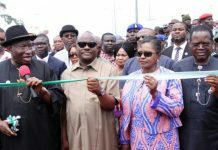 “So, this (reconstructed) road is a blessing to us, and I must tell you that, but for the dynamic leadership of Governor Wike, who took the bull by the horn, we would not have passed through that phase,” the VC said. Currently, the University is on the verge of accrediting more of its programmes. Until the Governor came on hoard, IAUE had only two of its programmes with full accreditation, while 24 had interim accreditation. But right now, the Institution is moving towards having most of its programmes securing full accreditation courtesy of the magnanimity of the Governor, who has shown an avowed commitment towards that end. At the Secondary School level, the governor commenced developments with an announcement, that all public secondary schools in the state will be rehabilitated. 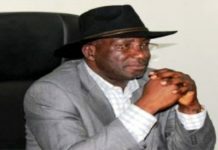 This, he said, will commence with Birabi Memorial Grammar school, Bori, Government Comprehensive Secondary School, Port Harcourt, and Government Secondary School, Ubima. Others are Government Secondary School, Rumuokwuta, Government secondary School, Isiokpo, Kalabari National College, Buguma, Maria High School, Bane, Nyemoni Grammar school, Abonnema, Okrika Grammar School, Okrika, Western Ahoada County High School, and Government Secondary School, Okaki. Currently, the renovation work, which the Governor said, will be in phases, is on-going in some of the schools. In preparation for the just concluded Senior secondary school certificate Examination (SSCE) he distributed funds to Principals of the 247 State-owned secondary schools to enable them acquire materials for Science practicals during the examinations. “With the distribution of the science equipment and materials for practicals, Principals have no reason to demand illegal levies of any kind from students in public schools. “This is a proof of my commitment to a functional educational system where no child is denied the opportunity of writing SSSCE simply because they are from a humble background”, he said. In pursuant to inculcating entrepreneurial education at the secondary school level, Governor Wike also revived the Rivers state school farm/Agriculture Business Initiative Project to sharpen students’ interest in commercial farming across the state. The scheme, which started at Government secondary school, Rumuokwuta, according to the Governor, forms part of the vision of his administration to give prominence to Agriculture with a view to making it an income and revenue earner for the state. 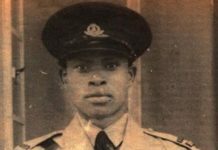 Beyond the stated developments, it may not be out of place to say that Wike’s quest for the development of the educational sector is further guided by what Malcolm X meant when he said “Education is our passport to the future, for tomorrow belongs to the people who prepare for it today”. True to these words, the educational sector in Rivers State got fresh lease of life from May 29, 2015. Currently, there is hardly any part of the State that the Governor’s drive for educational development has not affected. While in some parts the Governor’s impact is felt directly, in others, he sets the motion right in environment by either clearing backlog of debts, or appointing persons that are of like minds towards educational development. This explains why in all of the tertiary institutions there are completed projects and some others, ongoing ones, most of which are over 70 per cent complete. At the Rivers State College of Arts and Science (RIVCAS), for instance, the Governor doled out N30 million to facilitate the accreditation of more programmes in the institution. He also declared the release of the sum of N1 billion to reconstruct the management/Environmental Science faculties in RSUST. 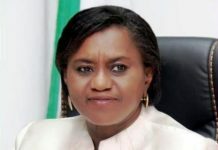 As a major of setting things right, Governor Wike not only set up a 7-man Committee to authenticate teachers whose promotions have been denied them for years, but also cleared the financial implications, just as he paid N200 million out of N500 million owed by the previous government to the management of Nne Kurubo Model Secondary School, Ebubu. In spite of these developments recorded by the government in its first year, however, a lot of Government-owned secondary schools, particularly those in the hard-to-reach areas are still lagging behind in terms of infrastructure and manpower, especially in the Riverine. In most of these schools, there are neither laboratories nor science equipment and sufficient teachers. Some of them are at best shanties. The implication of this is that development in the educational sector may favour those in the Urban area more than those in the rural areas. Moreover, this scenario is also indicative of lack in monitoring and Evaluation of developments in the educational sector, without which balanced development can hardly be achieved in the government’s pursuit of a viable educational sector.